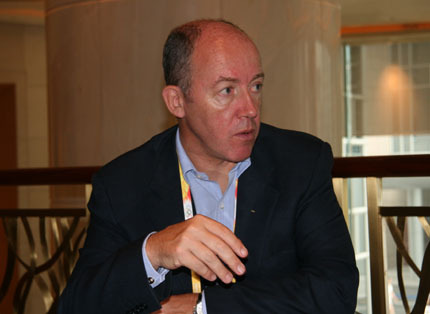 In an exclusive interview with China.org.cn, International Olympic Committee (IOC) marketing supremo Michael Payne has a simple message for the people of Beijing in the final run-up to the Olympics: ''All of the infrastructure and organization are in place. You've done all the hard work - now welcome your guests with a smile''. The image is a telling one, and could be used as an illustration of Payne's own 20-year career with the IOC. Twenty-five years ago the Olympics were almost bankrupt and facing collapse. Continually a pawn in the game of international politics, and struggling along on revenues that barely covered the IOC's own costs in organizing the Games, the future was looking grim. No city was interested in hosting future Olympics. Today in 2008 the Olympics is the biggest and most powerful brand image in the world bar none. Countries compete desperately with each other for the privilege of hosting the Games, and scenes of joy and triumph in the chosen cities welcomed the news of the award of the 2008 Games to Beijing and the 2012 Games to London. No person is better placed to explain this transformation in fortunes that Michael Payne, author of the book Olympic Turnaround. Payne was appointed the first ever Marketing Director to the IOC back in the early 1980s, and he and his team, with the support of key figures at the head of the IOC, defined and implemented the changes that have restored the shine to the Olympic crown. Payne now works on his own behalf as a Marketing Consultant with the highest of international reputations - providing support to the Formula 1 organization among others - but he is still a key figure in the Olympic movement and continues to work as an advisor to the IOC. His book is full of fascinating anecdotes, insights, and information about the commercial development of the Olympics. Some might accuse him of 'over-commercialization' of The Games, but to hear him speak with passion and commitment of the value of the Games as a Movement rather than a Brand would challenge the cynicism of the most hard-hearted sceptic. Back in the 1970s Payne was a 'hotdogger' on the free-style skiing circuit - a professional organization whose members depended entirely on prize money and sponsorship for their living. Like the majority of competitors in any sport, Payne never made it to the very top of the tree. As with many others in such cases, he discovered that his real abilities lay elsewhere. Coaching is a common alternative to competition in these circumstances - for example the best coaches in the world of golf are all individuals who failed to reach the highest level as players - but Payne turned to the commercial side, initially sourcing sponsorship for his fellow competitors, and in that field he has proved himself one of the very best.